We get it. Data accuracy is one of the top priorities for your multiple listing service. That’s why we’re adjusting the listing status change time frame so everyone gets better, more timely data. MRED had received feedback concerning the previous 72-hour listing status change time frame being too long. MRED’s Board of Managers approved this change as a way to combat outdated information. Moving to this 48-hour time frame provides real estate professionals and their clients with more timely data. Numerous connectMLS system enhancements (like the mobile-friendly Modern View) and general technological advancements allow brokers to easily access and update listings on the go. You can also email the Help Desk a completed status change form if you are unable to make a listing status change. That form is available under “Forms –> MRED Listing Forms, etc” in connectMLS. These options make it convenient and beneficial to abide by a shortened listing status change time frame. MRED polled Designated Realtors and the overwhelmingly majority said they would be able to observe this change. Please be advised, failure to comply with this rule will continue to result in an automatic $250 fine. Keep in mind, listings must be entered into the Standard Listing Network or Private Listing Network within 48 hours of the listing agreement or within 24 hours of advertising to the general public, whichever comes first. This advertising includes for sale signs, public-facing websites, and print media. The rule regarding failure to report new while publicly advertising is unchanged and carries an automatic $1,000 fine. Thank you for being a part of MRED. We’re excited to bring more timely data to real estate professionals and consumers. Still have questions? Check out these FAQs. We’re happy to help! Just contact MRED’s Rules and Regulations Department at 630-955-0011 or policychange@mredllc.com. *Listings must be entered into the Standard Listing Network or Private Listing Network within 48 hours of the listing agreement (after the date of the last required signature) or within 24 hours of advertising to the general public, whichever comes first. This advertising includes for sale signs, public-facing websites, and print media. In honor of Fair Housing month click HERE to take NAR’S fair housing quiz. Don’t forget April is Fair Housing Month. 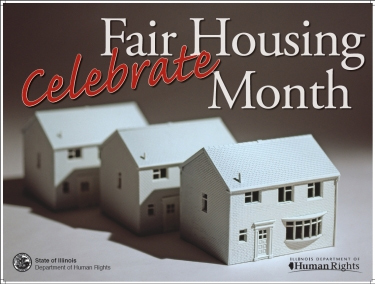 For more information on Fair Housing events in Illinois see the link below.